The perfect gift for stargazers and astrology lovers alike, this 12-notebook set with blank, lined, dotted, and graph pages is a stylish homage to the constellations of the zodiac. 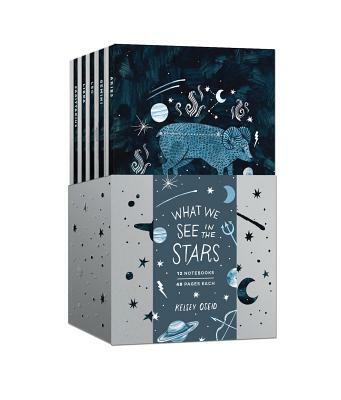 This striking and cool set of 12 pocket-size notebooks features celebrated illustrator Kelsey Oseid's signature paintings of the 12 constellations of the zodiac, from Aries to Pisces. Each notebook features a different foil-stamped constellation on the cover, and features high-quality interior paper (either blank, lined, dotted, or graph). KELSEY OSEID is an illustrator, painter, artist, and amateur naturalist who has illustrated a variety of children's books and runs an online shop where she sells prints and original pieces of her nature-themed work. Her work has been featured on Design*Sponge, Oh So Beautiful Paper, Everglow Handmade, and in magazines like Organic Life, Anthology, and Good Housekeeping. "Kelsey Oseid renders the history, science, and myths of our solar system in stunning hand-painted art." "What We See in the Stars explains the human connection we have to the cosmos and the scientific discoveries made by people from around the world over several centuries. Beautifully illustrated, its inky pages take you on a journey to swim alongside the stars and celestial bodies throughout our galaxy. Kelsey Oseid makes you aware of your own unique place in spacetime and artfully shows why you should keep looking up." —Ariel Waldman, author of What’s It Like in Space?